permanent markers such as Sharpies. Something to protect the table. 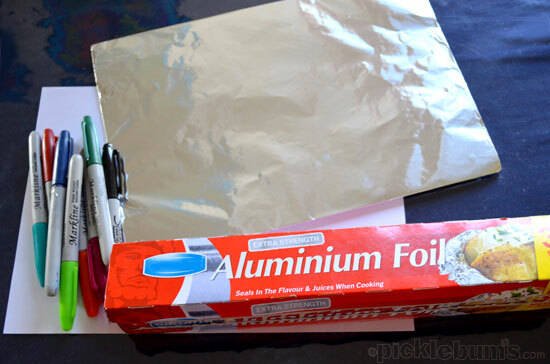 Wrap the foil careful around the paper or card, trying not to make too many wrinkles. This gives the foil a little more strength and makes it easier for everyone to handle. Then let loose and draw! This was one of those spare of the moment activities that turned out to be easy and really cool. All of my big kids made heaps of drawings and worked for a long time on each one as they liked the way it looked when you filled the whole page with colour. My kids love those markers too, and I have successfully gotten them out of clothing with lemon essential oil (that will actually even take them off a photograph without ruining the photograph and other hard surfaces) and then I put paper towel under the stain and pour rubbing alcohol (impt to put the paper under, or the ink will bleed through to the other side), then I put stain spray and launder. These just came out of my son’s church shirt doing that this morning. Just in case those markers stray :). I managed to get it off our table top with eucalyptus oil but that didn’t work so well on the toddlers top! Off to try your suggestions! Doing this tomorrow. 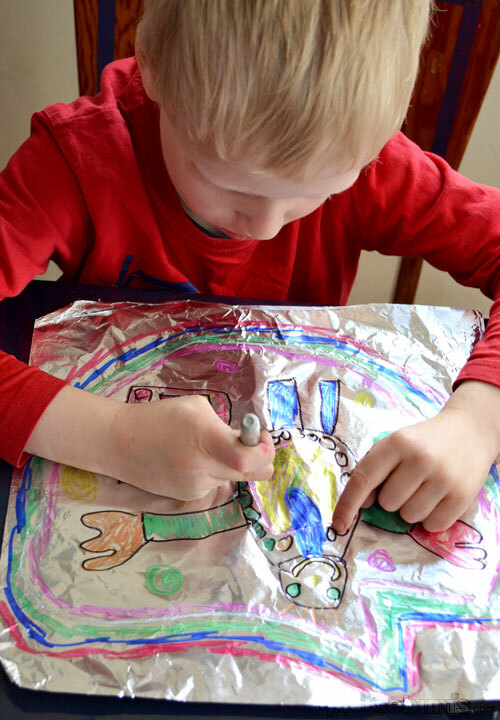 There is nothing better than drawing with my Sharpies according to my son and to draw on foil- can’t get much better than that. I want to try it too… :) He is gonna be so excited! Thanks for the inspiration. the markers look super vibrant..i think i will try paint first bcause they have been wanting to do that….but we will try some vivid markers, too! Great art idea. Love it. 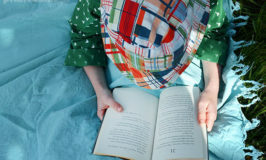 Will be doing this this weekend. Even though I’m very scared of permanent markers! Gorgeous pictures! I love how they all have their own individual style. 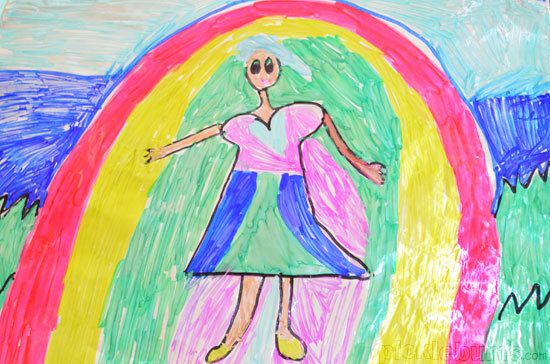 Your kids have certainly inherited your talent for colour and design. So, Kate, did it work on your stain? I would love to know. My son just had 2 small spots but they did come out. I hope your’s did too! 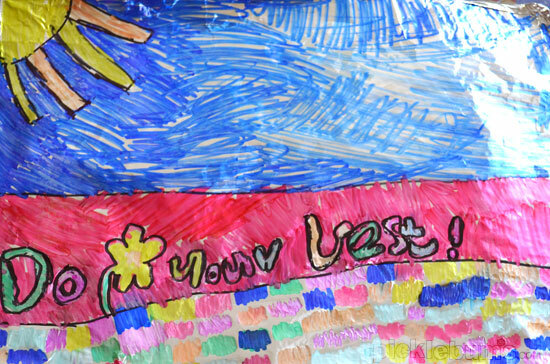 Just love those colours and original creations!Such inspiration and fun in these pics Kate! Oh, thank you for this idea. It is very timely. I spotted a pack of coloured Sharpies in the variety store the other day. Must head back there and buy a pack. Kate, I’ve never even thought of drawing on a different type of material. This is great! I love how the drawings turned out too. So bright and vibrant. Love this! 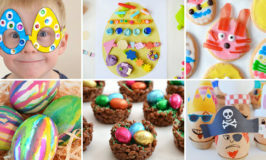 I already have this planned for some time in the future with my kiddies! 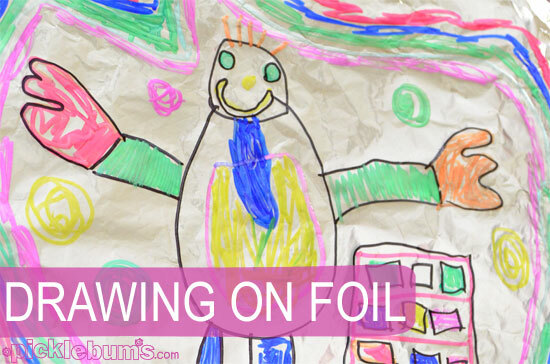 I have a memory of drawing on foil in art class in kindergarten. I’ve always thought there were some sort of special markers that we used and was just searching for them when I found your post. Turns out sharpies work and we have plenty of them! Thanks for this! I’ll be trying it with my daughters soon! This is a great tutorial with lovely results! I’ll be featuring it on The Crafty Crow!